~E.G. ORGANIZING~ is a full service home organization company serving the DC Metro Area. If you have found yourself here, there is a good chance you are in need of some help getting organized. Well, you’ve come to the right place! Maybe you are typically well organized, but a change in your life has made things get out of control. Perhaps you have been living in clutter for a while now and have finally decided to make a change. I help all types of people and situations. Everyone deserves a home that makes them happy and relaxed. Let me help you calm the chaos in your home. 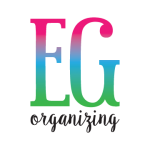 Contact Me to Get Organized! Just because under the sink isn’t the prettiest spot in the house, doesn’t mean it shouldn’t be organized. Long, shallow bins sorted these cleaning necessities and worked around the annoying pipes. Labeled perfection for this preschooler’s playroom. Picture labels are a great tool for non-readers to be able to clean up into the correct containers. It also has the added bonus of helping with sight words.